The consolidation and closure of parishes across the United States has become a fact of contemporary Catholic life. Responding to such an event is often traumatic. How do lay leaders allow their parish to heal when an approved ritual format does not exist? Through the voice of experience and local diocesan offices, Michal Weldon, OFM, has created a guide to the reconciliation process and the rites of parish closures in A Struggle for Holy Ground. 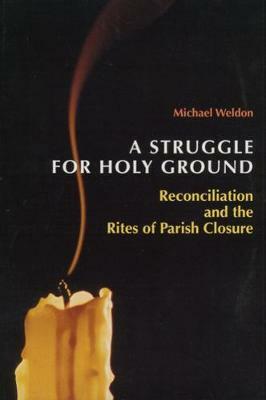 Composed of thirty-five interviews conducted from participants in the 1990 consolidation of ten parishes in Chicago's Englewood and participants in the 1995 San Francisco consolidation after the 1989 earthquake, A Struggle for Holy Ground offers a study for any parish leader to use as a reference when facing such a conflicted issue. This work explores the roles of ritual and pastoral care and proposes a series of new rites: group reconciliation, atonement, lament, leave-taking, memorial, and inauguration, based on the personal experience of those involved in parish restructurings. Chapters include: The Best We Could Do with Church? Demographics, Finances, and Culture, Traditions of Reconciliation: Conflict, Communion, and Sacred Remembering, The Negotiation of Crisis: Forgiveness, Trauma, and Sacred Space, Remembering in a Different Kind of Way: Grief, Lament, and Healing, Towards New Rituals of Reconciliation at the Closure of Sacred Space. Michal Weldon, O.F.M., D.Min., of Francis and Clare's Friary, Franklin, Wisconsin, is also an instructor at Sacred Heart School of Theology, Hales Corners, Wisconsin.